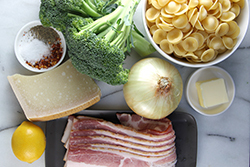 This pasta dish combines roasted broccoli with the complimentary flavors of zingy lemon, spicy crushed red pepper, rich Parmesan cheese, and crispy bacon. 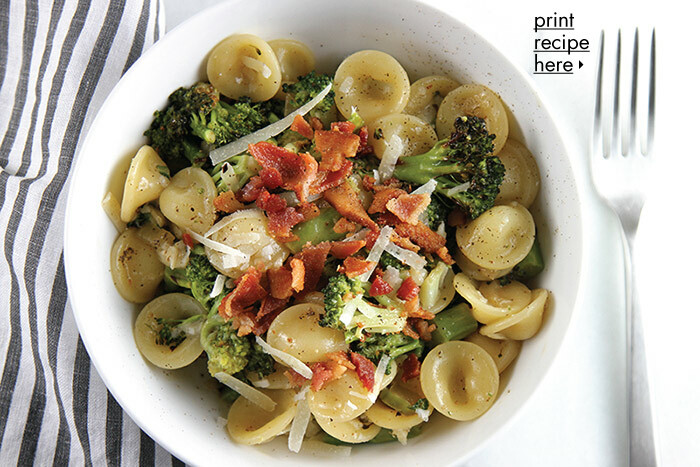 We love making this with orecchiette, small concave shapes known as “little ears,” but any shape of pasta would work well – it’s really all about the roasted broccoli! 1. 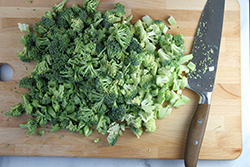 Preheat the oven to 450 degrees F. Prepare the broccoli by cutting into very small florets. Drizzle and toss with 2 tablespoons olive oil, Kosher salt, pepper, crushed red pepper, and lemon zest. 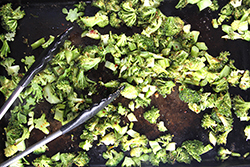 Spread the coated broccoli in a single layer on a rimmed baking sheet. Roast the broccoli for about 8-10 minutes or until the edges begin to brown. Tip: When roasting broccoli, don’t crowd the pieces, but leave plenty of room on the pan so that the broccoli roasts instead of steams. 2. Meanwhile, in a large sauté pan, over medium-high heat, fry the bacon until crisp, remove from pan and crumble. Set aside. Remove all but 1 tablespoon of the bacon grease from the pan, and sauté the diced onion until softened and translucent. Add the butter and sliced garlic, cook until fragrant. Add the lemon juice and chicken stock and bring sauce to a simmer. Cook gently until the liquid reduces by half. 3. Cook the pasta according to package instructions until it is al dente, -- just tender. Drain, reserving 1/4 cup of the pasta water. Toss the pasta to allow the water to escape the little concave shapes. 4. 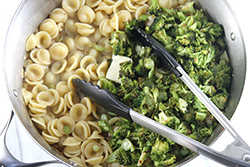 Add the roasted broccoli and the cooked pasta to the sauce in the sauté pan. Toss to combine. Stir in 1/4 cup of the Parmesan cheese, 2 tablespoons of butter, and a little of the reserved pasta water until the pasta is coated and silky with sauce. 5. Transfer the pasta to a serving dish or platter. 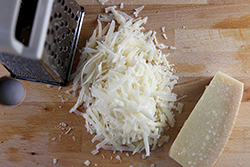 Scatter the bacon crumbles and remaining grated Parmesan cheese on top. Serve piping hot.